Banzai automates your event marketing from list building to registrations and automated reminders. Banzai identifies the best prospects for your event and connects you through automated personalized invitations. Drive quality new leads for your business with Banzai. Banzai empowers field marketers and event managers to manage and launch event outreach with a few basic details. Banzai handles the hard part: target list building, invitations, registration, and reminders. Banzai’s new Event Reminders services help to support marketing and sales leaders produce successful, well-attended regional or virtual events. 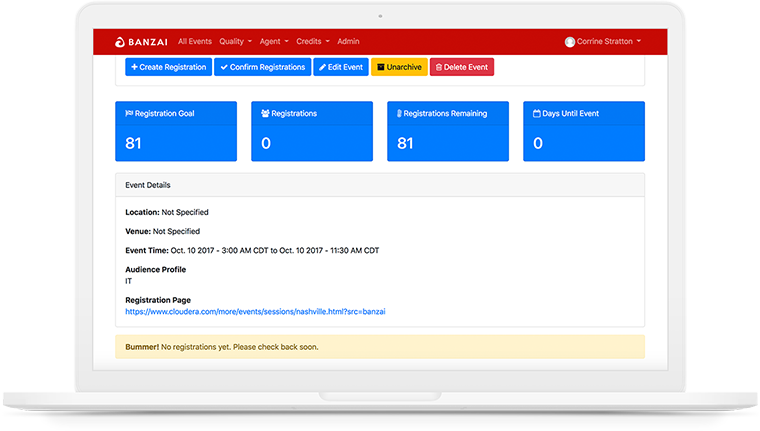 Upload your registration list, and Banzai automates all event reminders to maximize event attendance. Banzai’s Event Registration solution drives targeted registrations with the click of a button. Simply input an audience profile, identify a registration goal, and watch as Banzai identifies, invites, and registers highly targeted prospects. Banzai’s Webinar Registration solution automatically drives targeted webinar registrations to your upcoming virtual event. Campaigns can be segmented by webinar and registration type and are launched and tracked automatically.